Photo Credit: Cpl. 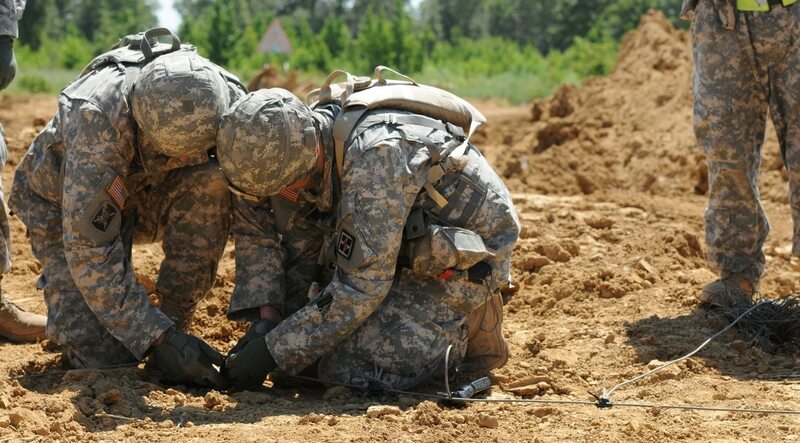 David Thompson, 326th MPAD Soldiers from 316th Mobility Augmentation Company, 844th Engineer Battalion, 926th Engineer Brigade, 412th Theater Engineer Command, tie their block of C4 explosive into a ring main at a demolition range held during River Assault 2012, at Fort Chaffee, Ark. Senior Army leaders have opened the combat engineer military occupational specialty to female soldiers as part of the ongoing effort to integrate women into closed jobs, Army Chief of Staff Gen. Ray Odierno said Thursday. "We've just approved opening up all positions in engineer to females, we're very close to approving all positions in field artillery for females," Odierno said during a virtual town hall with troops. He expects a decision about armor and infantry will be made "sometime in October" once the Army completes it tests and analysis. The only engineer MOS that was closed to women was 12B, combat engineer. Odierno made it clear that the decision to open positions to women was made by the defense secretary 18 months ago. In January 2013, then-Defense Secretary Leon Panetta and Joint Chiefs Chairman Army Gen. Martin Dempsey announced the end of the ban on women in combat roles, with the goal of opening about 237,000 positions to women by 2016. "What I would have to do is if I decide I want an exception, I would have to say why I believe we shouldn't open armor and infantry to females, and I would have to demonstrate why that's important," he said. "If I don't make any recommendations, everything will be open as of January 1st, 2016."